Step aboard Magic Bus and back into time! With bubbles in the air and a flower in your hair, feel yourself transported to the Summer of Love. Passing streets blend with historic projections on retractable window screens, creating a immersive experience so you can tune in, turn on and rock out! 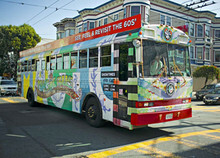 Our hippie hostess will guide you through time and space, telling the story of cultural landmarks and lesser-known secrets of San Francisco's hippie movement. More info, videos and reviews at http://www.magicbussf.com .